For the past few years, there's been a dedicated effort by some to get mandatory filters into EU copyright rules, despite the fact that this would destroy smaller websites, wouldn't work very well, and would create all sorts of other consequences the EU doesn't want, including suppression of free speech. Each time it pops up again, a few people who actually understand these things have to waste a ridiculous amount of time lobbying folks in Brussels to explain to them how disastrous the plan will be, and they back down. And then, magically, it comes back again. The draft of the proposal included a requirement that any site that doesn't have licensing agreements with rightsholders for any content on their site must take "appropriate and proportionate technical measures leading to the non-availability of copyright or related-right infringing works...." In other words, a mandatory filter. Incredibly, as Reda discovered, despite the fact that this issue is now in the hands of the EU Parliament, rather than the EU Commission, the metadata on the draft rules showed it was created by the EU Commission. After meeting with the MEP who is in charge of this, Reda posted that that individual, Axel Voss, claimed it was a "mistake" to include the requirement for "technical measures" (uh, yeah, sure), but still plans to make platforms liable for any infringement on their platforms. One of the many problems with this is that the people who demand these things tend to have little to no understanding of how the internet actually works. They get upset about finding some small amount of infringing content on a large internet platform (YouTube, Facebook, etc.) and demand mandatory filtering. Of course, both YouTube and Facebook already have expensive filters. But this impacts every other site as well -- sites that cannot afford such filtering. Indeed, Github quickly published a blog post detailing how much harm this would do to its platform, which in turn would create a massive headache for open source software around the globe. A special site has been set up for people to let the EU Parliament know just how much damage this proposal would do to free and open source software. Of course, the requirements would hit lots of other platforms as well. Given enough uproar, I imagine that they'll rewrite a few definitions just a bit to exempt Github. It appears that's what they did to deal with similar concerns about Wikipedia. But, that's no way to legislate. You don't just build in a list of exemptions as people point out to you how dumb your law is. You rethink the law. Unfortunately, when it comes to this zombie censorship machine, it appears it's an issue that just won't die. Limited time offer: Support Techdirt and get a Vote2016() t-shirt or hoodie! Techdirt tends to care about policy a lot -- and politics very, very little. But you have to admit that the 2016 Presidential election is fascinating on many different levels -- in part because the unfavorability ratings of both major party candidates is at record breaking levels, and perhaps for good reason. 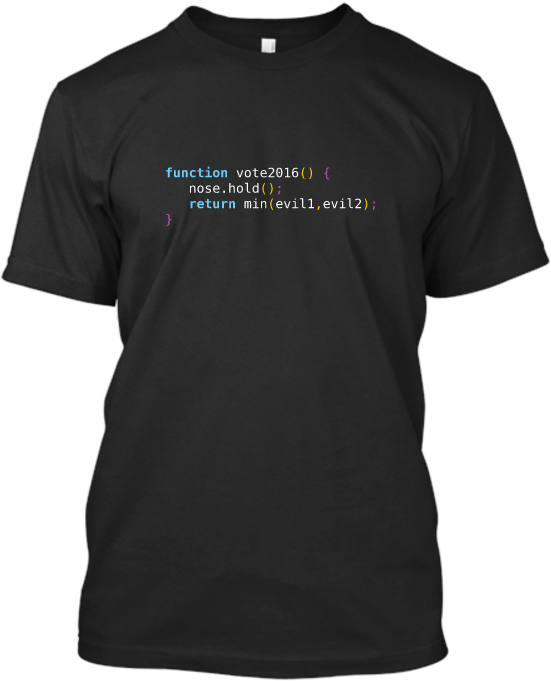 Since you guys seem to have really appreciated our first few t-shirts/hoodies, we decided to create a new one that reflected a more techie perspective on this election, and the recognition of how many people may be voting... expressed in code. Buying one not only gives you a chance to express your opinion (and geek-cred) on the election, but it also helps support Techdirt. Once again, we're using Teespring for this campaign, which means if you want in on the initial run, it's only available until Monday, August 15th, so order yours today. The t-shirts are only $20 and the hoodies are also a steal at $35 — and this time, it's also available as a sticker! Apple employees are already discussing what they will do if ordered to help law enforcement authorities. Some say they may balk at the work, while others may even quit their high-paying jobs rather than undermine the security of the software they have already created, according to more than a half-dozen current and former Apple employees. As the NY Times notes, these details certainly add some pretty hefty weight to the First Amendment arguments about "compelled speech" that Apple has made (and that the EFF doubled down on in its amicus brief). As for what then would happen... that's up to the court, but it's likely that the court would find Apple in contempt and/or start fining it. But that still leaves open the question of how does it comply if not a single engineer is willing to help out. There are all sorts of proprietary code out there, unavailable for inspection and perfectly capable of sending people to prison, as Slate's Rebecca Wexler reports. Defendant Martell Chubbs currently faces murder charges for a 1977 cold case in which the only evidence against him is a DNA match by a proprietary computer program. Chubbs, who ran a small home-repair business at the time of his arrest, asked to inspect the software’s source code in order to challenge the accuracy of its results. Chubbs sought to determine whether the code properly implements established scientific procedures for DNA matching and if it operates the way its manufacturer claims. But the manufacturer argued that the defense attorney might steal or duplicate the code and cause the company to lose money. The court denied Chubbs’ request, leaving him free to examine the state’s expert witness but not the tool that the witness relied on. That's a starkly mercenary stance to take. The "trade secret privilege" invoked here basically states that the company's potential loss of income outweighs a person's potential loss of freedom. It also asks for a level of trust it hasn't earned: that the software is as close to infallible as it needs to be. Cross-examination is next to useless when the software itself can't be examined. Worse, this closed-off software operates in a field where nearly every previous form of "indisputable" evidence has proven to be severely flawed. Studies have disputed the scientific validity of pattern matching in bite marks, arson, hair and fiber, shaken baby syndrome diagnoses, ballistics, dog-scent lineups, blood spatter evidence, and fingerprint matching. Massachusetts is struggling to handle the fallout from a crime laboratory technician’s forgery of results that tainted evidence in tens of thousands of criminal cases. And the Innocence Project reports that bad forensic science contributed to the wrongful convictions of 47 percent of exonerees. Everything tied to securing convictions seems to suffer from pervasive flaws compounded by confirmation bias. For four decades, the DOJ presented hair analysis as an unique identifier on par with fingerprints or DNA when it wasn't. A 2014 Inspector General's report found the FBI still hadn't gotten around to correcting forensic lab issues it had pointed out nearly 20 years earlier. This contributed to two decades of "experts" providing testimony that greatly overstated the results of hair analysis. All of this happened in the FBI's closed system, a place outsiders aren't allowed to examine firsthand. That's the IRL version. The software version is just as suspect. Computers aren't infallible and the people running them definitely aren't. If the software cannot be inspected, the statements of expert witnesses should be considered highly dubious. After all, most expert witnesses representing the government have a vested interest in portraying forensic evidence as bulletproof. Without access to forensic software code, no one will ever be able to prove them wrong. If a piece of software has the ability to deprive a member of the public of their freedom, its code should be open for inspection by the defense. "Trade secrets" should not take precedence over the public's right to defend themselves in court. Even in the highly unlikely event that Chubb's defense team would have copied the code and destroyed the company's future profits, it would still have the ability to seek redress through the court system. After all, that's the line the government uses when it argues for expanded "good faith exceptions" or warrantless searches and seizures: "Hey, if we screw up, you can always sue." The judicial system is a remedy for wrongs, both criminal and civil. What it shouldn't be is a protective haven where ridiculous assertions like those made here are used to prevent an accused person from learning more about the evidence being used to convict them. Should Your Self-Driving Car Be Programmed To Kill You If It Means Saving A Dozen Other Lives? Earlier this month Google announced that the company's self-driving cars have had just thirteen accidents since it began testing the technology back in 2009, none the fault of Google. The company has also started releasing monthly reports, which note Google's currently testing 23 Lexus RX450h SUVs on public streets, predominately around the company's hometown of Mountain View, California. According to the company, these vehicles have logged about 1,011,338 "autonomous" (the software is doing the driving) miles since 2009, averaging about 10,000 autonomous miles per week on public streets. "We just got rear-ended again yesterday while stopped at a stoplight in Mountain View. That's two incidents just in the last week where a driver rear-ended us while we were completely stopped at a light! So that brings the tally to 13 minor fender-benders in more than 1.8 million miles of autonomous and manual driving—and still, not once was the self-driving car the cause of the accident." If you're into this kind of stuff, the reports (pdf) make for some interesting reading, as Google tinkers with and tweaks the software to ensure the vehicles operate as safely as possible. That includes identifying unique situations at the perimeter of traditional traffic rules, like stopping or moving for ambulances despite a green light, or calculating the possible trajectory of two cyclists blotto on Pabst Blue Ribbon and crystal meth. So far, the cars have traveled 1.8 million miles (a combination of manual and automated driving) and have yet to see a truly ugly scenario. "Imagine you are in charge of the switch on a trolley track. The express is due any minute; but as you glance down the line you see a school bus, filled with children, stalled at the level crossing. No problem; that's why you have this switch. But on the alternate track there's more trouble: Your child, who has come to work with you, has fallen down on the rails and can't get up. That switch can save your child or a bus-full of others, but not both. What do you do?" What would a computer do? What should a Google, Tesla or Volvo automated car be programmed to do when a crash is unavoidable and it needs to calculate all possible trajectories and the safest end scenario? As it stands, Americans take around 250 billion vehicle trips killing roughly 30,000 people in traffic accidents annually, something we generally view as an acceptable-but-horrible cost for the convenience. Companies like Google argue that automated cars would dramatically reduce fatality totals, but with a few notable caveats and an obvious loss of control. "Utilitarianism tells us that we should always do what will produce the greatest happiness for the greatest number of people," he explained. In other words, if it comes down to a choice between sending you into a concrete wall or swerving into the path of an oncoming bus, your car should be programmed to do the former. Deontology, on the other hand, argues that "some values are simply categorically always true," Barghi continued. "For example, murder is always wrong, and we should never do it." Going back to the trolley problem, "even if shifting the trolley will save five lives, we shouldn't do it because we would be actively killing one," Barghi said. And, despite the odds, a self-driving car shouldn't be programmed to choose to sacrifice its driver to keep others out of harm's way." Of course without some notable advancement in AI, the researchers note it's likely impossible to program a computer that can calculate every possible scenario and the myriad of ethical obligations we'd ideally like to apply to them. As such, it seems automated cars will either follow the utilitarian path, or perhaps make no choice at all (just shutting down when encountered with a no win scenario to avoid additional liability). Google and friends haven't (at least publicly) truly had this debate yet, but it's one that's coming down the road much more quickly than we think. When code is treated like weapons, bad things happen. Governing bodies have previously treated encryption as weaponry, ensuring that only the powerful will have access to strong encryption while the general public must make do with weaker or compromised variants. More recently, the US government went after the creator of a 3D-printed gun, claiming the very existence of printing instructions violated international arms regulations. So, it's not just the end result that's (potentially) covered under this ban (the actual weapon) but the data and coding itself. That's currently being fought in court, carrying with it some potentially disturbing implications for several Constitutional rights. Now, it appears the conflation of physical weapons/weaponized code is possibly going to make things much, much worse. The EFF notes that the US government's adoption of recommended changes to an international arms trafficking agreement (the Wassenaar Arrangement) will likely cause very serious problems for security researchers and analysts in the future. The BIS's version of the Wassenaar Arrangement's 2013 amendments contains none of the recommended security research exceptions and vastly expands the amount of technology subject to government control. On its face, it appears that BIS has just proposed prohibiting the sharing of vulnerability research without a license. As if things weren't already dangerous enough for security researchers, what with companies responding with threats and lawyers -- rather than apologies and appreciation -- when informed of security holes and the US government always resting its finger on the CFAA trigger. Violating the terms of this agreement could see researchers facing fines of up to $1 million and/or 20 years in prison. Wassenaar was originally limited to physical items used in conventional weapons, like guns, landmines and missiles. It was amended in December 2013 to include surveillance tech, mainly in response to stories leaking out about Western companies like Gamma (FinFisher) and Hacking Team selling exploits and malware to oppressive governments, which then used these tools to track down dissidents and journalists. The push to regulate the distribution of these tools had its heart in the right place, but the unintended consequences will keep good people from doing good things, while doing very little to prevent bad people from acquiring and deploying weaponized software. Notably, the controls are not intended apply to software or technology that is generally available to the public, in the public domain, or part of basic scientific research. But, even so, it still contained the potential to do more harm than good. We have significant problems with even the narrow Wassenaar language; the definition risks sweeping up many of the common and perfectly legitimate tools used in security research. Either interpretation (Wassenaar, BIS) is a problem. The BIS version is much worse, but both will result in a less-secure computing world, despite being implemented with an eye on doing the opposite, as Robert Graham at Errata Security points out. [G]ood and evil products are often indistinguishable from each other. The best way to secure your stuff is for you to attack yourself. Thus, while Wassenaar targets evil products, they inadvertently catch the bulk of defensive products in their rules as well. And the results will disproportionately negatively affect those who need these protections the most. This is the end result of controls written with physical items (which originates from physical manufacturing plants and travel on physical means of conveyance) in mind but copied-pasted to handle "items" that can traverse the internet with no known originating point. The "open-source" exception in Wassenaar can be useful, up to a point. Researchers could post their findings to Github, as Graham points out, to ensure they're still protected. This, of course, means the Arrangement is still mostly useless, as the moment it's put into the public domain, any entity cut out of the distribution loop by this agreement can immediately make use of posted vulnerabilities and exploits. It also makes research destined to be open-sourced forbidden weaponry until the point it's actually made public. So, a laptop full of research is a prohibited weapon, while a Github post containing the same is not. When security researchers discover 0-day, they typically write a proof-of-concept exploit, then present their findings at the next conference. That means they have unpublished code on their laptop, code that they may make public later, but which is not yet technically open-source. If they travel outside the country, they have technically violated both the letter and the spirit of the export restrictions, and can go to jail for 20 years and be forced to pay a $1 million fine. "We generally agree that vulnerability research is not controlled, nor is the technology related to choosing a target or finding a target, controlled." However, she undermined her message by stating that any software that is used to help develop 0-day exploits for sale would be covered by the proposal. Again, bad for researchers. This gives the government leeway to imply intent when prosecuting, because the allowed and the forbidden look very similar while still in their formative stages. [T]he only difference between an academic proof of concept and a 0-day for sale is the existence of a price tag. Even if the exploit is not on the market at the point the government steps in, it would take very little to insinuate that it would have been headed to market, if not for the speedy intervention of regulators. There is some good news, however. The BIS is accepting comments on its proposed adoption (and partial rewrite) of the amendments to the Wassenaar Arrangement. The comment period ends on July 20, 2015, so sooner rather than later would be good if you're interested in steering the government away from doing further damage to the livelihoods of security researchers. The Obama administration made a really dangerous and ignorant argument to the Supreme Court yesterday, which could have an insanely damaging impact on innovation -- and it appears to be because Solicitor General Donald Verrilli (yes, the MPAA's old top lawyer) is absolutely clueless about some rather basic concepts concerning programming. That the government would file such an ignorant brief with the Supreme Court is profoundly embarrassing. It makes such basic technological and legal errors that it may be the epitome of government malfeasance in a legal issue. We've written a few times about the important copyright question at the heart of the Oracle v. Google case (which started as a side show to the rest of the case): are software APIs covered by copyright. What's kind of amazing is that the way you think about this issue seems to turn on a simple question: do you actually understand how programming and software work or not? If you don't understand, then you think it's obvious that APIs are covered by copyright. If you do understand, you recognize that APIs are more or less a recipe -- instructions on how to connect -- and thus you recognize how incredibly stupid it would be to claim that's covered by copyright. Just as stupid as claiming that the layout of a program's pulldown menus can be covered by copyright. The judge in the district court, William Alsup, actually learned to code Java to help him better understand the issues. And then wrote such a detailed ruling on the issue that it seemed obvious that he was writing it for the judges who'd be handling the appeal, rather than for the parties in the case. Unfortunately, the judges at the federal circuit court of appeals (CAFC) didn't pay attention and made a completely ignorant ruling, in which it became so clear that they didn't understand the difference between software and an API that it was almost embarrassing. The decision quoted people in ways that were completely out of context, where the CAFC judges clearly misunderstood what was being said. This ruling would fundamentally kill off important forms of innovation if allowed to stand. It would be a disaster. So, of course, the case has been appealed to the Supreme Court -- and that's where Donald Verrilli steps in. The Supreme Court asked the Solicitor General if the US had an opinion on the case. This apparently led to a healthy debate within the Obama administration over the position it should take. I know that there are people within the administration who understand these issues. Hell, Ed Felten has just been appointed deputy CTO for the administration and he, of all people, recognizes the difference between an API and software (in fact, he signed onto an amicus brief saying as much). He also (more than most) understands the copyright side of things and the potential impact of getting this wrong. But instead of listening to the people who actually understand the technology, it appears that Verrilli sided with the copyright maximilist/technology-ignorant faction in the government. The final brief argues that the Supreme Court should stay out, that the CAFC got it right, and that it's impossible to distinguish between APIs and software. Because Donald Verrilli has absolutely no clue how software works. That's a fundamentally ridiculous argument, and argued out of near total ignorance of the basic facts of this case. Despite the inherently functional character of all computer code, the Copyright Act makes clear that such code can be copyrightable. Nothing about the declaring code at issue here materially distinguishes it from other computer code, and petitioner has identified no genuine conflict of authority concerning Section 102(b)’s applicability to circumstances like these. Although petitioner has raised important concerns about the effects that enforcing respondent’s copy-right could have on software development, those concerns are better addressed through petitioner’s fair-use defense, which will be considered on remand. No, no, no and no. Everything about the declaring code distinguishes it from other computer code if you understand the first thing about computer programming. One is computer code. One explains an interface for communicating with computer code. They're fundamentally different things. It's like arguing that there is fundamentally no difference between a recipe and a fully cooked meal. And yet, that's exactly what Verrilli and the Obama administration are now arguing to the Supreme Court. Because they don't understand even the most fundamental things about code, and assume that because an API looks like computer code (because whoever wrote this brief is ignorant of coding), they're the same thing. Later in the filing, Verrilli, again, seems to assume that an API is the same thing as "computer code." If the Copyright Act contained no explicit references to computer code, one might reasonably conclude that such code is not protectable “expression” at all. Computer code differs in a fundamental way from many traditional means of literary expression. A book or newspaper article is meant to be read and comprehended by a human being as a description of an idea or story. Although many copyrightable written documents explain how practical tasks should be per-formed, there is typically a clear distinction between the written explanation and the actual performance of the task. Computer code, by contrast, is both expression and the actual means by which a computer is induced to perform the desired function. It therefore would not be unnatural to describe computer code as a “method of operation” or “system.” Nor would it be unreasonable to conclude that, as between a book on bicycle-building and the actual construction of a bicycle, computer code is more analogous to the latter. This makes no sense. At all. Of course, computer code is copyrightable. But an API that is just a method of how to interact with that code is not computer code. yet the Copyright Act unequivocally recognizes that a person can own a copyright in computer code.... Rather, the uncopyrightable “method of operation” or “system” or “process” is the underlying computer function triggered by the written code—for example, an algorithm that the computer executes to sort a data set. The code itself, however, is eligible for copyright protection. Again, yes, of course the code is copyrightable. But the code is not the API. It's incredible how fundamentally the Solicitor General doesn't seem to grasp this simple concept. When the filing eventually tries to get around to the difference between an API and software code itself, it basically just throws up its hands, saying "well, it looks like code, so it's all the same to us." That distinction does not withstand scrutiny. Both declaring code and implementing code ultimately perform the same practical function: They instruct a computer to work. The declaring code tells the computer to call up the implementing code, and the implementing code tells the computer to perform an operation, such as executing a sorting algorithm. Both are necessary components of a Java or Android method. And neither the declaring code nor the implementing code is what a programmer physically types when invoking a method. Yes, and the recipe and the ingredients are both "necessary components" of a meal, but that doesn't make them the same thing. Hell, to be more specific, the recipe and the description of how to prepare a meal are both necessary and they look fairly similar. But in copyright law the recipe is not copyrightable, while the description may be. That's the same thing with software code and APIs. But because the folks who wrote this brief are either ignorant -- or ridiculously chose to ignore those who do understand these things -- we get this absolutely embarrassing brief from the US government. It's a travesty. Furthermore, Verrilli seems to be suggesting that the important Lotus v. Borland case which found that the layout of a computer program's menu structure were not covered by copyright, was decided incorrectly! The precise rationale of Lotus is not clear. Parts of the opinion purport to rest on the proposition that Section 102(b) can foreclose copyright protection for original expression.... But other parts of the opinion seem to apply a principle analo-gous to the merger doctrine, to the effect that, be-cause there was only one menu hierarchy that would allow users to operate the spreadsheet program in substantially the same way, the menu hierarchy (un-like the underlying code) could not acquire copyright protection.... Whatever the rationale of Lotus, however, the decision cannot reasonably be read to treat Sec-tion 102(b) as applicable to computer code itself, a form of expression that the Copyright Act clearly protects and that the First Circuit took pains to distinguish. Indeed, many of petitioner’s specific contentions will be relevant to its fair-use defense on remand. For example, although it would be anomalous to use Section 102(b) to distinguish between different segments of a single work of authorship..., Section 107(3) instructs courts to consider “the amount and substantiality of the portion [of a copyrighted work] used in relation to the copyrighted work as a whole” in adjudicating a fair-use defense. That petitioner copied only respondent’s declaring code while writing its own implementing code should therefore be a relevant factor in the lower courts’ fair-use analysis. But this, too, is wrong. There's a big difference in saying "this is not copyrightable" and "this can be used thanks to fair use." Fair use is (unfortunately) limited and dependent on a number of factors. Something that is not covered by copyright is open to all comers. The difference is really important and the Solicitor General doesn't even care at all. The freedom to reimplement APIs also helps developers rescue “orphan” software or data—systems that are no longer supported by their creators. When a company stops supporting a computer platform or service, the ability to freely reimplement APIs protects the communities that rely on that software. Government entities and non-profits are especially susceptible to the orphan programs problem as they often cannot afford to upgrade and are left using legacy technologies for years or decades. It would be truly ridiculous that, just because the MPAA's former top lawyer is so ignorant that he can't comprehend the difference between an API and actual software, that the Supreme Court would allow such a terrible ruling as CAFC's to stand. We've written about the problems of DRM and anti-circumvention laws since basically when we started way back in 1997. Cory Doctorow has been writing about the same stuff for just about as long (or perhaps longer). And yet, just when you think everything that can be said about this stuff has been said, Doctorow comes along and writes what may be the best column describing why DRM, combined with anti-circumvention laws, is so incredibly nefarious. Read the whole thing. It's so well done, and so important, I'm actually going to write two posts about it, because there are two separate issues that deserve highlighting. This is an important point summarized so perfectly that it deserves to be repeated over and over again. Because any circumvention of DRM is considered illegal, even if the purpose of the circumvention itself is legal, it basically gives not just "the copyright industries" but pretty much any industry the road map to stop people from making, say, fair use of copyrighted works. Or, worse, preventing them from tinkering with products they own. It allows them to wipe out fair use and other important user rights -- by just writing into code that it's not allowed, and even though that code is easily breakable, making that code breaking itself a form of "infringement." In short, DRM with anti-circumvention restrictions lets industries simply route around the aspects of copyright law that are designed to protect the user's rights. We've seen entrepreneurs take on these kinds of high risk/high reward challenges before (Aereo comes to mind, though so do ones that ended up failing in court, such as ivi and Zediva), so this seems like a very real possibility. This would be an important ruling not just to free up innovation, but to bring back the rights of the public, and to stop an encroachment that began years ago, entirely at the behest of a legacy entertainment industry who was focused on using mechanisms of control to remove the freedoms of the public, solely to protect an obsolete business model. In past years we've had stories about both Oregon and California claiming copyright over their own laws, which is ridiculous. If copyright is supposed to be about the incentives for creative expression, then it should have nothing to do with lawmaking at all. It's not as if the state needs a copyright incentive to write laws -- though some states have tried to argue that it needs the incentive to entice big corporate entities to print the laws. That, too, is ridiculous, as plenty of public domain info gets printed all the time -- and it really has no bearing on the simple fact that laws are public domain material, considering that the public is expected to know and obey them. While the Copyright Act makes it clear that any work done directly by federal government employees is automatically in the public domain, it's just slightly squishier when it comes to works from state governments, though there, too, it is generally believed that they fall in the public domain, as they should. In the last week, a lot of attention was paid to the fact that Washington DC had been claiming a copyright on its laws, saying that you could not download a digital copy, and the state couldn't even release an entire copy of its own laws under a FOIA request, because of the copyright and the contract it held with outside publishing firms (initially West and, more recently, Lexis). As with the stories in Oregon and California, the person who helped drive attention to just how crazy this is was Carl Malamud, hero to everyone who believes in the importance of open access to public information. This time, he paid $803 for a copy of the code, scanned it all, and sent copies on USB drives in the shape of famous American Presidents to a bunch of folks. Normally, at this point in the story, we hear about the local government hemming and hawing or even issuing vague threats. But not in the case of DC. Over the course of a few days, it appears that Washington DC's tech savvy General Counsel V. David Zvenyach quickly moved to deal with the problem. Part of the issue was that the only digital copy of the code that they had was the one given to them by West, and it contained a variety of extraneous information that was West's IP, including West logos on each section of the law (representing many thousands of copies). Zvenyach had Joshua Tauberer come by and spend a day removing every bit of West IP from the document and quickly releasing a downloadable copy of the DC Code with a CC0 public domain license. That's pretty awesome. To go from having the code locked up for no good reason to a public domain downloadable release in days is pretty cool. Kudos to Malamud, Zvenyach and Tauberer for their part in this, as well as Tom MacWright, who first sought the copy of the code and brought this issue to the attention of Malamud and others. There are a few things that this isn’t: it isn’t the official copy of the code, and lawyers would be ill-advised to cite it alone. It isn’t up-to-date – the council is fast-moving and this is just a snapshot. In time we’ll fix these problems too. Yes, even though it's being released directly by the DC Council on their website, it's designated as an "unofficial copy" and it's only up-to-date through last year. However, hopefully others will get it up to date, and eventually the DC Council will be able to list an "official" copy as well. Oh, and for those living in or around DC, MacWright is also planning a hackathon around this new code, to see what awesome and useful tools people can build on top of it.